Internal linking is an important SEO tactic, but it’s also important to optimise the site experience for users. In this article, look at the importance of internal linking for publishers, and explain the tactics I use on this blog. I don’t claim to be the font of all knowledge on this issue, so I’d love to see your tips as well…. The creation of internal links is an important element of search engine marketing. Unlike external linking the site owner has complete control over internal links, so it’s important to make the most of it. There are a number of compelling reasons for good internal linking, some are SEO tactics, others are just about improving the user experience. I’ll look at the SEO-related reasons first, before looking at the advantages for the user. Some pages on your site may have more link equity than others, so it’s important to pass some of that equity onto pages you’d like to improve rankings for, or pages that are more likely to convert visitors. For example, we’d like to rank for terms such as ‘Pinterest best practice‘ since we have just released a report on the topic. However, our guide is nowhere on the first few pages of Google for that term, but this article has the number eight spot. Since we use Idio, it also has the added bonus of ensuring that the Pinterest report is promoted in our ‘Recommended reports’ tab. Links are a great way to help Googlebot through your site. Here’s Matt Cutts on the subject. Among other things, he advises that descriptive anchor text helps search engines to better understand your content. It’s also useful for users. I encourage our writers to add internal links as it helps us to use relevant anchor text to link to older articles and reports. As mentioned above, relevant anchor text helps search engines to index your pages. However, some SEOs advise that anchor text should be varied as many pages linking to one page using the same anchor text may look suspicious to search engines. If someone has come to your site attracted by an article on a particular topic, then it makes sense that they may want to read related content, so give them some ideas for further reading. For example, you may have written a brief article on a topic which you have covered in more detail previously. Naturally, you’d want to encourage readers interested in the topic to read the article you spent more time on. If people arrive at an article and you give them some related content and somewhere else to go once they have read it, then it gives them a reason to stay on the site a little longer. Ideally, we’d like people to visit the blog to read and article, then decide they’d like to stick around and read some more. Of the publishers surveyed in our Content Marketing Report, 69% said they use internal recommendations to provide inspiration for where to go next. 50% are using third party technology for this, 35% in-house solutions, and 15% are providing manual recommendations. We do a little of everything, including the box showing most popular and most commented posts to the right of the article, as well as the recommended reports box below. It’s also important to add links within posts, as these are more likely to be directly related to the article in questions, and therefore more likely to be clicked. As you can see below, the posts featured here all have plenty of internal (and external) links, and the bounce rates are much lower than the blog average of around 77%. The one slight exception is the 2013 trends posts I referred to earlier, but here I think the sheer length of the article (4,000+ words)is deterring some readers and pushing up the rate. Links are a great way to back up the point you’re making, and this applies to external as well as internal links. For example, if I’m writing an article about checkout optimisation, rather than listing the reasons for customers leaving the site, I can link to an article showing stats on abandonment. Different publishers will have different ‘money making’ areas of their sites, but it’s important, without necessarily going for the hard sell, to nudge people towards those pages. In our case, we recommend reports that are relevant to the article, and which readers may find useful if they want more stats, or to investigate the topic in depth. We’ll also recommend events that are coming up, or things like our Digitals awards. A good proportion of our blog traffic is generated by archive posts, and now and again older articles do the rounds on Twitter, as someone discovers them via search or a link from a newer article and decides to share them. We have written more than 10,000 articles since this blog was launched in 2006 and, while things move quickly in the online world, some of our older content is still very relevant and useful for readers. Turn that into real-time offers on your website, and jackpot! Angels sing. All the web’s kittens dance. 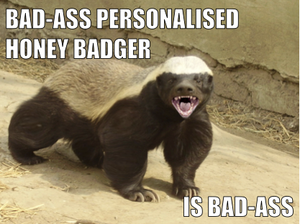 And you’re badder than honey badger overnight. A whole host of technologies have emerged to make this happen. Marketers have no problem finding solutions to personalise their websites. The core challenge remains: what’s the best way to do personalisation? According to Toprank CEO Lee Odden’s recent SES London session, content marketing at its very minimum needs to include: brand leadership, customer empathy, storytelling and creativity. Here are three reasons why some of that creativity should be visual, regardless of your brand or industry.